Recently Amazon CEO Jeff Bezos was named the world’s most wealthy man.There is no question that Amazon has disrupted and is disrupting many industries from booksellers and retail to grocery, music and much more. Luckily for the banking and finance sector, Amazon hasn’t set its sights on that industry (yet)! But what can banks learn from Amazon, so they can innovate before a disruptor like Amazon completely shakes up the market. Amazon has built their business on using customer data. What products you look at on Amazon and what you buy, is analyzed to optimize their offer to each customer. You can bet that if Amazon was sitting on the same gold mine of data that banks have, their approach would be very different. Artificial Intelligence tools like Natural Language Generation, “Natural Language Processing and semantic analysis” can help banks use all of the customer data to create unique offers for unique customers. What Banks Can Learn from Amazon is to actually use data to sell to each customer like the individual that they are. Amazon understands the value of human beings and machines working together to accomplish more, better than either could alone. If you’ve ever had a problem with Amazon, you know they offer stellar customer service. They do this by leveraging data, by having a seamless transfer between automated service (chatbots) and human-led service, but lastly they use technology to enhance the ability of their customer service team. Banks rely on an infrastructure-heavy approach and while that is beginning to change, most banks still try to appear on the main street. This is related to the point above because they rely on a human being sitting down across a table and offering advice. By moving some of their services online, to video chat, or chat and by combining technology with human beings, banks can change their business model. It should not be on the street or online, it should be a circle in which customers get the same 100% personalised service no matter the channel (online, chat, face to face or on the phone). In short, what banks can learn from Amazon is: be agile, technology is best used to augment not replace and whatever you do, USE YOUR DATA. 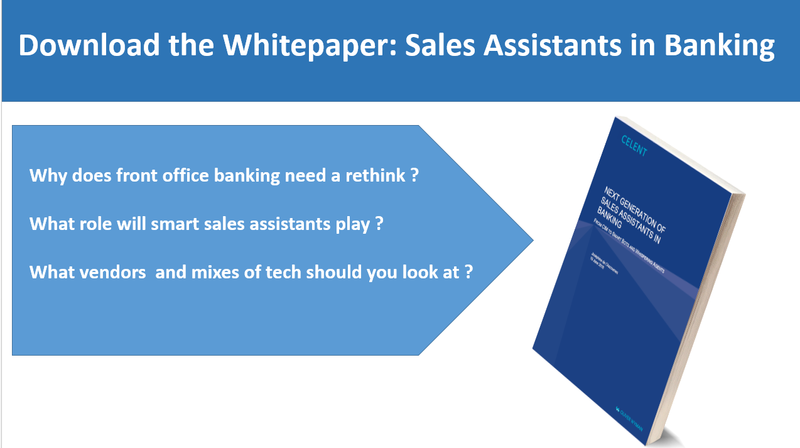 Download the white paper “The Next Generation of Sales Assistants” to learn more.